The Center for Graphic Facilitation: Attention Lefty Scribes! 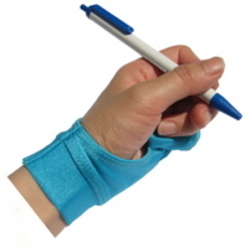 My son is left-handed and kept getting the side of his hand dirty from unwanted graphite and ink smudges in school, so we ordered him a SmudgeGuard. The glove, which covers his pinky, is made of nylon and spandex, so it fits snug to his hand and glides easily over the paper when he's writing fast. Usually, when my son writes, his hand will start to perspire. The SmudgeGuard stays dry making it less likely to re-smudge the paper. Because it's only protecting the areas most prone to smudges and because the material is thin, he can also type on a keyboard or do other things while wearing it. You could certainly take a normal glove and cut the fingers off, but if you used cotton gloves, it wouldn't glide over paper as well. Also, this guard doesn't look homemade or tacky. If my son wore a cut-up glove to school, I'd imagine his classmates would definitely tease him (he's in second grade)! With the SmudgeGuard, my son has not experienced any teasing from his classmates at all. In fact, the kids were very curious about it, which actually made him popular for the day because none of them had ever seen anything like it before. Now the teacher doesn't have to ask him to redo his homework or tell him to erase the smudges and smears. And no more poor posture (my son used to twist his hand and body in a weird way to avoid smudges). He says it's very comfortable to wear. Just wanted to let everyone know that I bought SmudgeGuard and it really works! I didn't get anymore smudges on my hand, it's light, comfortable and it's fun to wear! You guys should try it! I give it thumbs up! Hey, that's really cool! I have been writing with smudges for the longest! I have tried everything from faster drying ink pens, to slanting my paper to avoid smudges. But it never worked for me. I'm gonna get SmudgeGuard since it seems so simple to use and works for pencils, pens and markers! How convenient! Thanks for posting this up Peter!